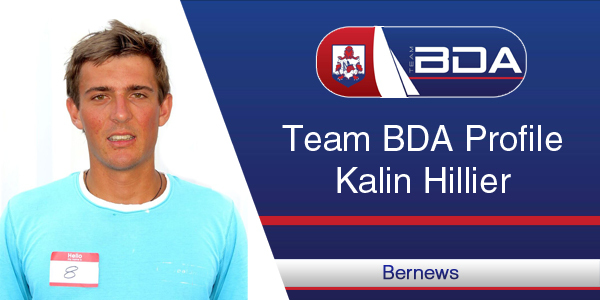 In the latest of a series of profiles of members of Bermuda’s team in the Red Bull Youth America’s Cup, we spotlight Kalin Hillier, who provided insight into the dedication and training that it takes to represent one’s country at the very highest of levels. Q: Tell Bernews something about yourself. A: I am 21 years old and attend Dalhousie University, I study Globalization with a Minor in Spanish. Prior to university, I completed my A levels in England and my IGCSEs at Saltus Grammar School. Q: What made you try out for Team BDA in the first place? A: It is a childhood dream sailing in the America’s Cup and once the opportunity was given I pounced on it as quickly as I could. It’s the future of sailing and after watching clips of foiling catamarans being chased my power boats, coupled with my love for extreme sports and speed, there was no way I would walk away from this opportunity. Q: Now that you are in Team BDA what do you hope to achieve – you want to win, but do you think you will take sailing even more seriously and look for a career in it, or at least to get more involved in it? A: Pursuing it as a career is a hard question, I love sailing and if the opportunity was offered I would take it, of course. However, my main focus is working in the corporate world in order to enhance my knowledge and to a broaden my horizons. On the other hand, I am keen still keen on an Olympic campaign. Q: Do you think that taking part in an event like this is something that will stand you in good stead for the rest of your lives? A: Yes, definitely, being on the Red Bull Youth America’s Cup is a good asset to have, it shows determination and drive. Many classify sailing as a ‘luxury’, ‘easy’ sport, whereas most of the time it strengthens your mental strength [thinking ahead, dealing with stressful situations], your physical [cardio, fighting ropes,] and communication. You learn to react quickly in difficult situations which definitely can help an individual’s future. Being on this team will definitely remain with me for the rest of my life. Q: What does it mean to you to be a Bermudian, racing in Bermuda for Bermuda in such a prestigious event? A: Representing your Island within your Island is a huge achievement; in fact, it gets my adrenaline going just thinking about it. I am very excited to represent Bermuda battling it out with some of the biggest sailing countries. Racing in Bermuda will be a blast and I am certain our team will represent well. Q: What excites you most about the time to race time? A: What excites me the most is getting our team together and pushing all as a unit. We have a lot of diverse knowledge within our group, allowing different leadership styles to take place, which I personally feel can make our team strong, mentally and physically. We can learn from each other either in the gym or on the water which will create a great morale for our team. Of course my main aim is to get foiling as soon as possible but I know this will take a little more time. However, we have great all rounded coaches who constantly remind us how much more we have to keep pushing. Q: Do you think the Red Bull Youth America’s Cup has the potential to leave a lasting legacy for Bermuda? A: I hope so, like I have said it is the future of sailing. The RBYAC will be watched worldwide and seeing these boats foil on top of Bermuda’s pristine waters will make it hard for many to forget about the America’s Cup and Bermuda. Q: What sailing experience do you have? A: I have been sailing since the age of eight. I come from a sailing orientated family who have always given me support and encouragement in sailing. I sailed mainly single handed boats such as the Laser, Bytes and Optis. I have competed overseas in different championships [North, South, Europeans and Worlds]. I have also done double handed sailing, however foiling on catamarans is something new and cannot wait to push these boats to their limits. Team BDA is Bermuda’s entry into the Red Bull Youth America’s Cup that will take place in the Great Sound in June 2017. They are mentored by Oracle Team USA and will race on the same high-speed AC45F catamarans seen during last October’s Louis Vuitton America’s Cup World Series in Bermuda. The team comprises of 15 young Bermudians who will form the crew, the back-up crew and shore crew. Team BDA is being funded entirely by donations. Team members are Connor Astwood, Mackenzie Cooper, Peter Dill, Preston Farrow, Na’eem Griffith, Philip Hagen, Kalin Hillier, Mustafa Ingham, Emily Nagel, Daniel Pell, Nicholas Pell, Owen Siese, Dimitri Stevens, Shomari Warner and Cecilia Wollmann. Well done Kalin! Keep up that drive and determination, stay motivated and focused mate – these will increase your chances of making it through to the final stage of Team BDA’s selection process! Kalin is a great young man who has represented himself, his family and his Island well. Very proud to know him and wish him continued success.